It's time for a barbeque! Shazel is a demon princess. She'd never let her friends in Paragon City know, though, because having the great Hak-el-zul for a father is more of a burden than an honor as far as she is concerned. Being the only daughter of the lord of the realm meant she was kept hidden away in the palace under tight guard for as long as she could remember. Lord Zul couldn't hide his love and pride for her and that had made her a target among his enemies. However, the tighter he squeezed, the more she rebelled. She was fire, not just in form and power, but in personality as well and Hak-el-zul found it hard to control her. After a particularly nasty spat, he had banished her to solitary confinement for a "decade or two to cool off". Infuriated, she activated the technique she'd so carefully learned in secret from watching the palace shamans. In an instant she appeared in a dark underground chamber surrounded by confused looking humans in robes. The tallest one had stopped chanting mid-sentence to stare at her mouth gaping. Coming out of the shock, he yelled, "A CHILD? You fools summoned a demon CHILD!? That did it. If she wouldn't take lip from her own father, she sure as Zof wasn't going to take it from these creepy humans. Moments later, the lesser members had fled the room like flaming bats while Shazel busily tossed white-hot flares at their leader's feet. "Dance you pompous buffoon!" she growled. Suddenly, a blue flash blasted her new toy across the room and a group of human heroes burst into the room weapons ready. She prepared to fight, but stopped cold when one asked, "Are you alright? Did they hurt you?" Shazel paused for a moment, confused, until a wicked realization crossed her mind. These heroes though she was a captive. With a malicious twinkle in her eye and a sly smile, she said, "yes I'm fine, but can you get me out of here?" From there, the heroes led her to Paragon City where she learned more about their world. It wasn't long before she was introduced to Hero Affairs and soon after began hero training. Shazel delighted in the thought of her father furiously trying to find her and someday discovering what she'd been doing all this time. And the one thing she wouldn't admit even to herself; though she came to the human world to spite her oppressive father, she really liked the City of Heroes and the friends she found there. Preference for nighttime, dark places. Signature red stripe. Usually accompanied by Screaming Gale. It's not that dark you baby! For as long and she could remember, in her earliest memories, the artifact beckoned to her. She made many attempts to reach it, but whenever she'd get near, her parents would scold her, and hide it again. But no matter how hard they tried, she would always find it. It's warm presence pulsed like a heartbeat and she could hear its tiny voice speaking her name no matter the hiding place, no matter the magic wards they placed around it. Once, she'd almost pulled it out of the secret panel in the wall of the basement until her mother snatched it away, swearing. The next day, her parents bought a magic lock-box and placed the artifact inside. With a confident smirk, her father handed it to her and said, "That takes care of that". Confident as all children are, Jordan hid a triumphant smile and ran to her room, locked the door, and desperately tried everything she could think of to get the box open. Despite her efforts, it stubbornly held tight. After several hours, she tossed it across the room in frustration. For weeks, Jordan threw tantrums and pleaded, but nothing swayed her parents resolve. All they'd tell her was that it was too dangerous and she'd know more about it "in time". Time indeed passed, but with it grew her connection to the artifact. At first it was just a presence, but then thoughts and words. She knew without a doubt that the artifact was alive after a fashion and she was concerned about how her parents treated it. After all, she knew, though she didn't know how, that whatever inside wasn't dangerous at all. It felt more like a lost friend that needed to be found. So she set her mind to finding a way to getting inside, with or without her parents' approval. Besides her regular studies, she snuck into the library and pored over ancient texts and scrolls honing her skills in secret. Sadly, even then the box proved to be far beyond her level. By her freshman year, she'd become a fairly formidable magic wielder far outpacing her peers. She could practically feel her imagined victory becoming real and she was sure it wouldn't be much longer till she reached her goal. She didn't know how right she was. Though Jordan knew the artifacts her parents dealt in were powerful, she had no idea that they were also valuable, and even less idea how much attention her family had gained among the local outlaws. Several city gangs and dark organizations had been watching with hungry eyes. By chance it was a Hellions gang leader who first found a way past the house protections. Knowing his time was short before the wards were strengthened or before rivals beat him to it, he organized a raid for the next full moon. On that fateful night, just a few weeks after her 14th birthday, the Hellions gathered in ranks around her house under the bright August moon. Jordan woke to a cacophony of sounds. Men yelling and laughing, her mother's scream, fire bursting from the walls, and the sounds of breaking glass and splintering wood. The Hellions took what they could carry and smashed or burned what they couldn't. By the time they reached her room, Jordan had already erected protective wards within which she stood defiantly holding her artifact box tightly. Though she acted brave, she knew that her spells were no match for the demon worshipers even before they laughed and strode across the room waving wards out of existence like cobwebs. Jordan curled away clutching the box closely to her chest when she felt it ripped away from her hands. She yelled and whipped around striking out blindly, determined that they not take it, when she froze. The Hellions had stumbled back as the box floated swiftly to the center of the room on its own. Looking confused, they started to stand up and take stock, but had no time before the box pulsed once, twice and then exploded in a blast of dark energy knocking the invaders against the walls and plunging Jordan into darkness. Jordan floated in the darkness, unable to see or feel anything except her precious artifact, released and floating silently before her. It pulsed quietly, once, twice, and then whipped suddenly towards Jordan becoming intangible and shapeless as it approached. It plunged into her chest and Jordan stood stunned as waves of sensations washed over her. In an instant that seemed to last a lifetime, the artifact's essence filled her like water in a vase. All at once she knew its true nature. Jordan was born with strong powers… So strong the elders were afraid of what she might do to herself and those around her. Something had to be done. They gathered the greatest wizards and witches of their clan. Along with their familiars, fifty in all. Together, they created the artifact, sealing as much of her power as their combined strength could manage. What no one could foresee was that a small part of her lifeforce fractured and was trapped within the artifact as well. The shard of Jordan lived and grew just as Jordan did eventually reaching some level of consciousness. Though not intelligent, it was connected to her and reached out, longing to return. It was this shard of consciousness that, sensing danger to itself through Jordan, wielded the sealed powers and returned "home". A full ten years before the elders had planned, Jordan regained her formidable sealed power. When the police arrived, they found the gang members running and stumbling over each other to escape, while others begged for protection. Howling spears of dark energy dipped, swirled, and rushed through the air breaking windows, splintering doorways, and blackening the ground in patches. When the dark stains upon the ground rose up into oily black tentacles, even the police started to back away. As the otherworldly energy in and around the house thickened to an almost palpable intensity, curious onlookers who had gathered froze as the darkness began to growl menacingly. At first a tremor, but soon a malevolent quake shook the ground, trees, and even the air. 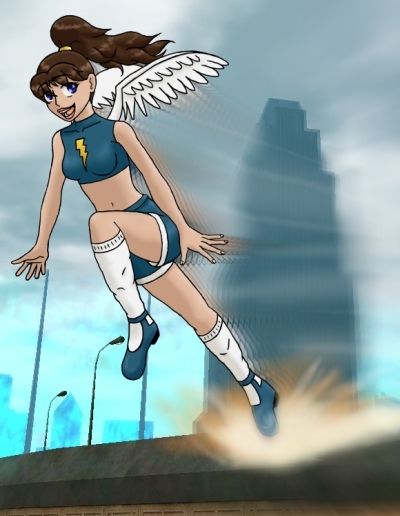 Everyone started to turn and run, when, with a lightning crack of energy, Azuria the mystic appeared on the front lawn. Without a word she ran into the house as dark tentacles and black energy disintegrated at her approach and reformed almost as quickly behind her. Just as the crowd began to worry for Azuria's fate, an unnatural screaming wail sounded across the neighborhood as the nether energies imploded back into the house. No one spoke or moved until, no longer able to stand the onslaught, the sad structure that used to be the Yen home collapsed inward upon itself. The only thing that remained standing was a bright sphere of light. Inside stood a human figure cradling another who was clearly unconcious. Before any details could be made out, with a flash of light and another crack of power, they disappeared and all went deathly quiet. In the hours that followed, the family sifted through the wreckage salvaging what they could. When neighbors came to offer their condolences and asked what on Earth had happened, they were shocked at the reaction. With a proud smile and tears in their eyes, Jordan's parents beamed, "She's finally ready! Jordan's Hero Training has finally begun!" Loud voice. Pony tail. Trail of destruction wherever she goes. OMG! TAHTS A LOT OF ENMEIES!!1! Gale was a pretty normal kid. Well, I guess looking back she really wasn't, but we didn't know any different. I mean every kid is loud. How were we supposed to know? Sure, there were clues like how my wife always said Gale's crying gave her headaches. Or the time she fell off her bike and scraped her knee. Her bawling set off every dog in the neighborhood. And then there was the time she threw a tantrum because we were having broccoli casserole for dinner… Shattered every piece of glass in the room, heh. I guess that was a pretty good clue right there. Another thing, and we didn't think anything of it then, but she would watch storms for hours. Rain storms I mean. Anyway, if it was thundering and blasting bolts all across the sky, even better. She wasn't ever afraid like some other kids. Sometimes we'd find her outside soaking wet and cold and her mother'd go on for days after about "common sense" and "coming in out of the rain" and such. Gale would just say she couldn't hear the "song of the storm" as well from inside which would just set my wife off again. We never could get her to stop standing in the rain. Whenever she was sad, it seemed like a good rainstorm was the only thing that would cheer her up. Come to think of it, it did seem to rain a lot when she was feeling blue. Well, anyway, it became pretty clear that she had "powers" not too long before she turned 15. Her little brother decided to give her a really good scare and hid behind the door. Whew! That was one loud scream. But not just that, it blasted the kitchen stove through the wall and across the yard! And then lightning struck it… three times! Blam! Blam! Whop! Thank goodness it was just the stove (shudder). So it was about that time we figured that we better get her some training before we lost any more appliances… or worse. We took her down to Hero registration and signed her up. Now, she wasn't too excited about Hero work. She never was too good with scary things and there's a lot of scary stuff in Hero work. But, she's met some real fine kids who seem to be taking her under their wing. Like that Jordan girl. She's got a darkness about her, but I can tell she has a good heart. Seems she's been doing real well in the Hero business so hopefully our Gale can learn a thing or two from her. Jordan loved being a hero, though at first it wasn't easy. Wielding the powers of darkness tended to give people the wrong impression. It might be more accurate to say that most people couldn't tell if she was there to save them or feed them to demons. But in only two years, her hard work and dedication were recognized and she was given the title of "Hero of the City". Though she was only 16 years old, she was sitting among the greatest heroes of Paragon City waiting for a portal to spawn for their latest operation. She glanced around the room and had to stifle a laugh when she thought about the stark contrast between the legend and reality of these famous leaders. Each was revered as a mentor and model to all heroes, but she wondered if opinions would change if people knew what they were actually like. Manticore, who was actually quite vain, was standing in the back of the room picking barely noticeable specks from his suit. Jordan knew that he was keeping his distance to avoid the dust kicked up during portal activation. 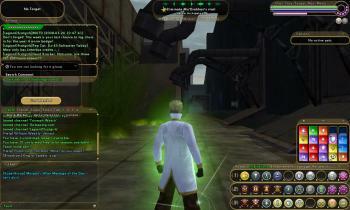 Citidel stood guard directly in front of the portal scanning for problems or signs of attack from the target site. Rolling her eyes, Jordan verified with a glance that no one else was worried. She had to admit that he was a well seasoned hero, but she tried to avoid him. His idea of conversation was a long one-sided lecture. The others would joke about how he could arrest villains by boring them into submission. In contrast, there was Positron who was chatting amiably with Sister Psyche. Being encased in a technological suit tends to make you look stiff and hard. But when Jordan first met him and shook his hand, she was stuck by an electrical charge so strong she thought her heart might stop. With his face hidden, she might never have known that he'd done it on purpose if he hadn't started laughing so hard. It turns out that Positron was an incurable prankster and often drove the others crazy with his thoughtless practical jokes. But like the others, Jordan found she could never stay mad at him for long. He'd always find a way to make her laugh and forgive him even if she didn't want to. Statesman was leaning against a wall trying to look suave while talking to Swan. Jordan thought back to the first time she met him at Pocket D during a party and blushed. He might be old enough to be her father, but that didn't stop him from shamelessly flirting with her. She snapped out of her musings as she noticed the others making their way towards the portal. She stood up and brushed herself off. As a new Hero of the City, she and several others would now be personally trained by the Freedom Phalanx in Firebase Zulu. The senior Heroes walked towards the portal as it finished forming and stepped through one by one. Jordan's day-dreaming had cost her in that she now stood at the end of the line. She drummed her fingers impatiently on her arm until it was finally her turn. Mere inches from the portal, she stopped as a siren blared accompanied by technicians loud yells. She spun around to see what was wrong, not noticing the frenetic turbulence forming in the portal behind her. Everyone fled in panic, except for one man who stopped long enough to excitedly shout something and beckon wildly to her before he disappeared behind the blast door. The portal screamed like a thousand discordant birds and out of the corner of her eye she saw it flex like it had been struck by a giant fist. With practiced reflexes, she bent down and dug in her feet for an all-out run. Even as she shifted her weight to take the first stride, in a instant that seemed to take hours, the portal's spinning tendrils of energy collapsed to a single point, then burst. Trapped in a agonizing moment, she horrifically felt the energy first envelope her back foot, her hips, head, and finally outstretched arm as her world exploded in light and sound all around her. Jordan drifted in the void. As her consciousness roused, she realized that she couldn't see or feel, all physical sensations were gone. She thought back. There was an accident. Something had gone wrong with the portal she entered, but… the thought escaped her. "Child, you have been wronged. I can see the great justice and righteousness within you. Like you, I fought for right with all my power and fury, but a mistake has brought me low and my end is near. But now, an opportunity… I may be able to strike back after all. With the last of my power, I can return you to where you belong." "I am a Kheldian. One of the greatest of my kind!" "I accept," she said. "Together we will live to fight again." "No," he corrected. "I am too weak. Though my power and physical essence shall become yours, my awareness will dissipate." Jordan sensed his bitterness change to maniacal glee as he continued, "But it matters not. Had you not come, the end would be the same, though now I will have revenge. With you, the evil that crawls the universe will again know fear! Now hurry, my time grows short!" His "voice" was growing fainter. Jordan's only had to think for a moment. A return to life and immense power? She bubbled with excitement as she reached out to embrace the being. With a tiny pang of compassion she asked, "What is your name?". As his life force fused with hers, she reeled as the world started to spin and roar all around her. "My name is greatness. My name is power. My name is righteousness. But the important question, my young legacy, is what is your name?" Jordan could barely hear him now. "My name? What is my name?" She felt dizzy and closed her eyes. Eyes! In shock, she reached up to touch her face. Hands! She opened her eyes. The cocoon of blistering light that surrounded her began to peel away in wisps and she found herself standing high on a building in Paragon City. Regaining her balance, she stood up straight. She paused and looked down at her hands, palms then backs, as if trying to confirm the reality of it all. She willed power to appear and it obeyed, shooting from her hands into the sky. Searching inward, she felt the last glimmer of the Kheldian flicker… and disappear. She repeated the question aloud, "what is my name?" Feeling the emotions surge within her, she closed her fists and looked out over the city she fought to protect, the city she loved, the city she'd died and returned for. She began to laugh, "Not even death can stop me. I'll fight again, only stronger than ever before! My name… is Jordan Yang!" And a harsh laughter echoed among the buildings as Jordan Yang took to the skies. I will show them the shadows! Jordan drifted in the void. As her consciousness roused, she realized that she couldn't see or feel, all physical sensations were gone. She thought back; There was an accident. Something had gone wrong with the portal she entered, but… the thought escaped her. "Lost one, though we are both beings of darkness, you used yours for good while I for evil. My pitiful existence is finally at its end, though my past is rife with pain and regret. Though I accepted this end, an opportunity has presented itself. Your arrival marks a chance; a possibility that I may be able to repay my debt. With the last of my power, I can return you to where you belong." "I accept," she said. "Together we will live again." "No," he corrected. "I am too weak. Though my power and physical essence shall become yours, my awareness will dissapate." He must have sensed Jordan's shock because he continued, "Do not lament. Had you not come, the end would be the same, though now I have hope. Hope that for all the chaos I have brought to the world, my legacy will be that of good. I would gladly give you all I have for the hope you have given me! Now hurry, my time grows short!" His "voice" was growing fainter. Jordan's emotions were conflicted, but she was certain that she wanted to live again. She reached out to embrace the being. "What is your name?" she asked. As his life force fused with hers, the world started to spin and roar all around her. "I have no name, but the question is, what is your name?" Jordan could barely hear him now. "My name? What is my name?" She felt dizzy and closed her eyes. Eyes! In shock, she reached up to touch her face. Hands! She opened her eyes. The cocoon of darkness that surrounded her began to peel away in wisps and she found herself standing high on a building in Paragon City. Regaining her balance, she stood up straight. She paused and looked down at her hands, palms then backs, as if trying to confirm the reality of it all. She willed darkness to appear and it obeyed, shooting from her hands into the sky. Searching inward, she felt the last glimmer of the nictus flicker… and disappear. She repeated the question aloud, "what is my name?" Feeling the emotions surge within her, she closed her fists and looked out over the city she fought to protect, the city she loved, the city she'd died and returned for. "I'll start again! I'll learn to use these new powers and renew my battle against evil! My name… is Jordan Yin!"